10:00 a.m. 1st Communion Pics CLICK HERE! 1:00 p.m. 1st Communion Pics CLICK HERE! 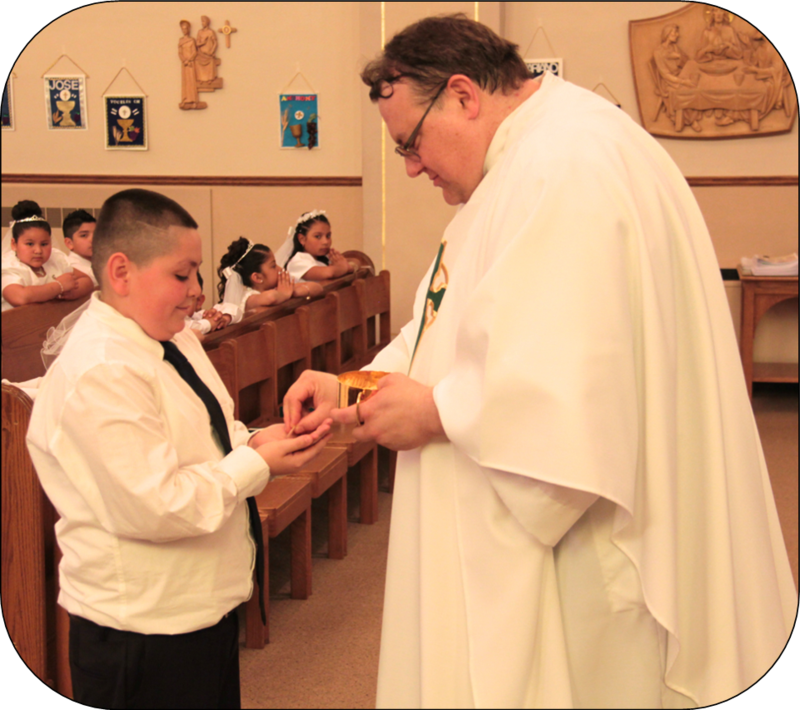 4:00 p.m. 1st Communion Pics CLICK HERE! 2018 Holy Week at St. Patrick's! This year, two young adults from St. Patrick's Church received the sacraments of baptism, confirmation and Eucharist at our Easter Vigil Service Five other children were baptized as well. So many good folks were responsible for the myriads of events that took place this week. On March 3rd, St. Pat's celebrated its 180th Anniversary with a special Mass & Dinner, complete with bagpipe and folk music and the Keigher Irish Dancers. The house was full and the Irish Spirit was wonderful! Thanks to all who made this event a successful one! Congratulations to Fr. Matt, who was ordained a priest on Saturday, January 20th at St. Thomas the Apostle Church in Chicago by Most Rev. Joseph Perry. His first Mass took place at St. Patrick's Church on Sunday, January 21st. From November 28 - December 7, Fr. Pete led a group of forty-five pilgrims to the Holy Land for a set of concerts and spiritual experieces that became a once-in-a-lifetime opportunity! On his return from Israel, Fr. Pete gifted the faithful from St. Patrick's by blessing them with oil taken from the lamps that were placed on the altar of the tomb of Christ. He also poured blessed water from the Sea of Galilee into the entry fonts of Church. He then presented each family with a blessed olive wood rosary and candies from Israel. You are able to view both pictures and videos for this event here! "Fiesta Weekend" took place at St. Patrick's Church on Sep 30 - Oct 1 where we celebrated seven First Communions, a Pet Blessing, a Living Rosary and a really nice End of the Summer Party that kept building momentum as the night grew longer. Much thanks to everyone who made this wonderful event possible! 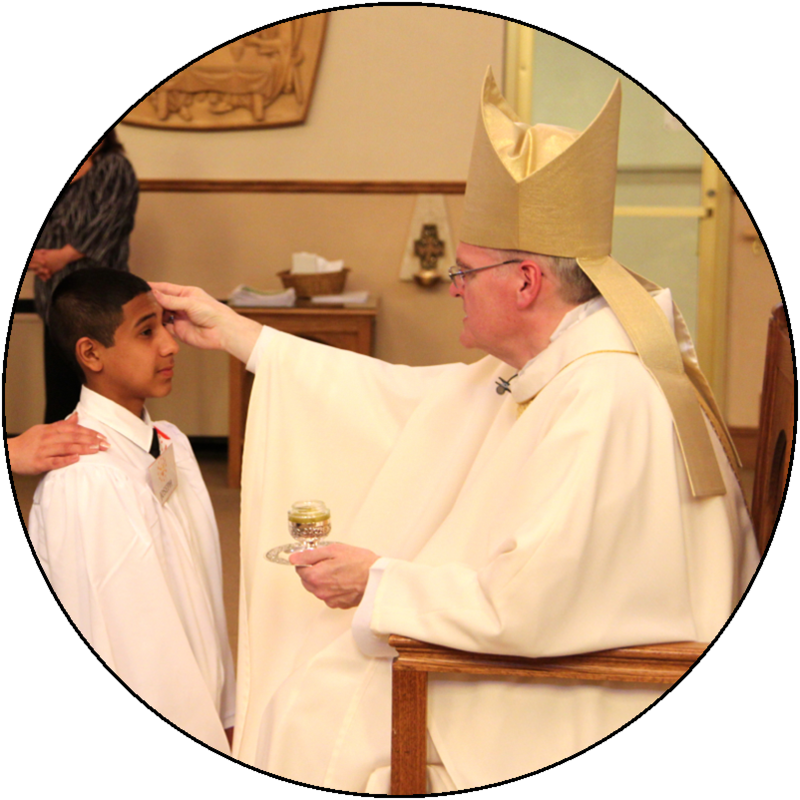 On June 10th, Bishop Joseph Siegel confirmed fifty children at St. Patrick's Church, which culminated our Religious Education Program for the Year. 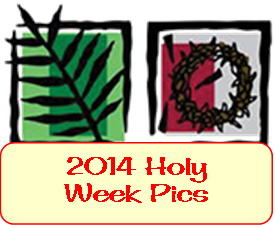 2017 Holy Week at St. Patrick's! This year, ten young adults from St. Patrick's Church received the sacraments of baptism, confirmation and Eucharist at our Easter Vigil Service. So many good folks were responsible for the myriads of events that took place this week. On April 8th, the students from our First Communion Program (and their families) gathered in the gymnasium so that DRE Julie Dillenburg could bake them fresh, homemade bread with juice! The kids also were invested with the scapular and were invited to bring religious items to be blessed by Fr. Pete. On April 1st, our Annual Event for Teens of the Parish leads to the culmination of our Religious Ed Program and the Celebration of the Sacrament in June! On March 4th, the faithful from St. Patrick's gathered for our annual Irish celebration, assisted by Brian McKee on the bagpipes, the Keigher Irish Dancers, Rustic Detour with some Irish folk music and Maria Jankowski and her crew providing a wonderful Irish feast. Much thanks to the kids in our Religious Education program and all our volunteers for helping with the event. Some 150 strong attending all three nights of our parish mission on February 20-22, led by Marian Priests Fr. Bill Hayward & Fr. Diego Maximino. By far, this was the most successful mission in the history of St. Patrick's Church and we are so grateful for all that participated. 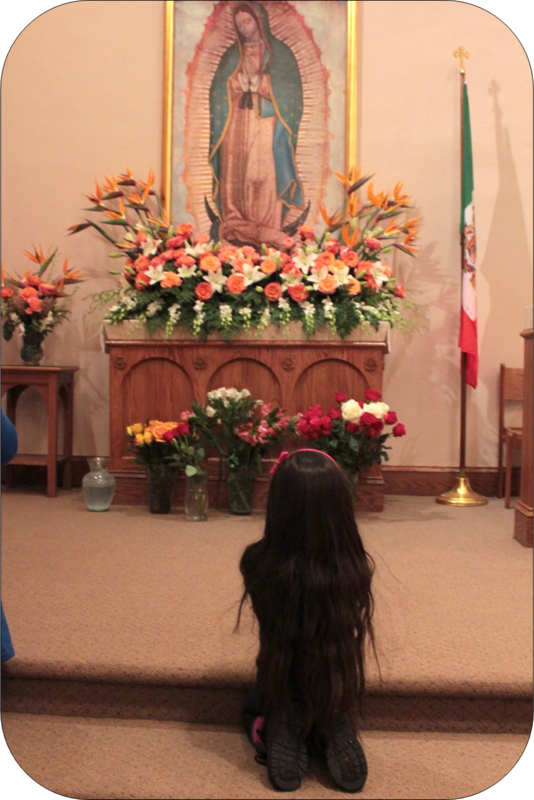 On October 12 of 1945, Pope Pius XII declared that Our Lady of Guadalupe (who appeared to St. Juan Diego in 1531) was the patroness of all the Americas, North and South. In honor of that declaration, St. Patrick’s Church celebrated a festival in her honor, starting with ten hours of confessions on December 11th. The next day, the faithful gathered for an early morning prayer called “las mañanitas” (or the little mornings) for two hours of song and praise. After a noon rosary, we gathered again at 7:00 p.m. for spirited dancing, a liturgy attended by over 500 and the distributing flowers to the mothers. After the liturgy was another social and more music. Much thanks to El Rio Grande Restaurant and our volunteers for the food and donations! 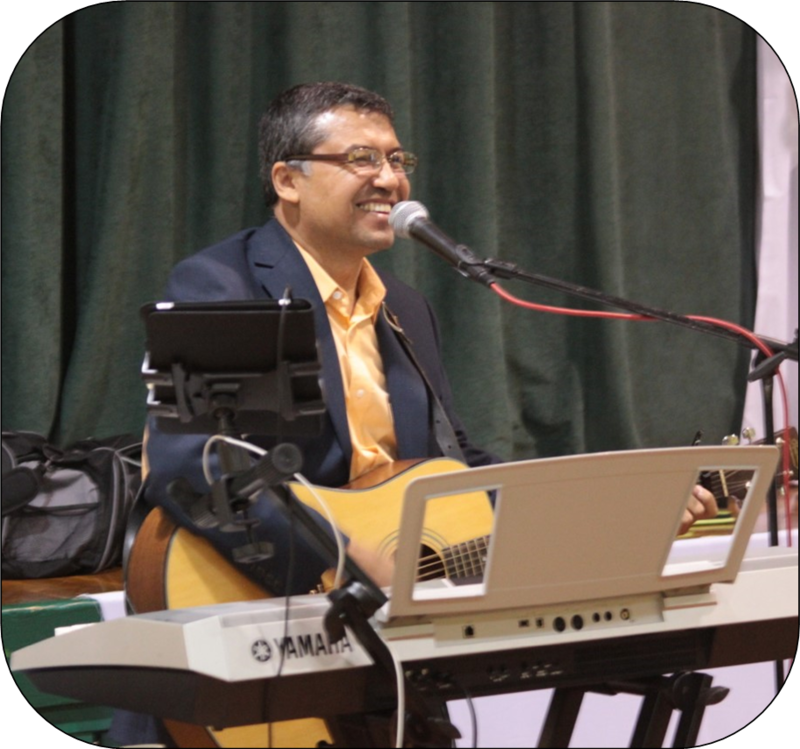 This Year's Summerfest Celebration was held on June 25th in our St. Patrick's Gym. The proceeds for the event are being directed towards converting some of the bathroom stalls in our Head Start building to accommodate those who are handicapped. If you would like to help us raise $10,000 towards this cause, please contact the office at (815) 727-4746. On June 12th, Benedictine Abbot Hugh Anderson confirmed forty-five children at St. Patrick's Church, which culminated our Religious Education Program for the Year. On June 4th, Fr. Pete Jankowski offered the Holy Eucharist for the first time to just under seventy children at St. Patrick's Church. On May 22nd,over four hundred souls packed our Pat Paul Gymnasium to enjoy a Polish Dinner and a St. Luke Theatrical Production on the life of the saint who instituted the Divine Mercy Chaplet, St. Faustina. This truly was a parish event, as representatives from all the major parish groups helped make this day such a spectacular event. This was the second play this school year sponsored by St. Patrick's Church; the other took place in November 2015 with the presentation on the life of St. Therese of Lisieux. 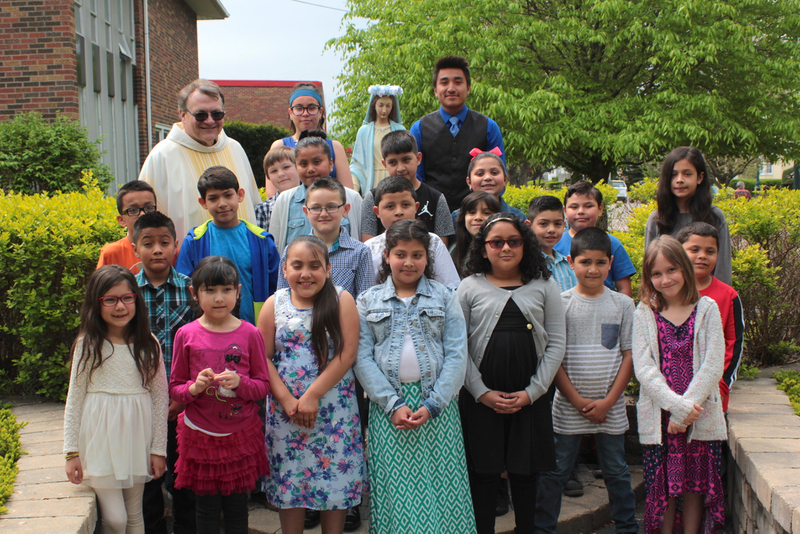 On May 8th, students from our Confirmation and First Communion Classes participating in our Annual May Crowning at our Marian Garden of St. Patrick's. As May is designated the Month of Mary in the Catholic Church, it is most fitting that we teach our kids about this important devotion. We are most grateful to all of our faithful who have dedicated their lives to these prayers on behalf of themselves and those of the faith! From the Legion of Mary's Annual Conference to our Right to Life Parade to our St. Joseph's Table and all the Holy Week Activities, this most sacred week at St. Patrick's was a busy one indeed! Take a look at all the wonderful pictures that illustrate the grace that poured forth this most sacred time of the year. On March 5th, the faithful of St. Patrick's gathered for prayer and social time at our annual event. Much thanks to the Brian McKee and the Bagpipe, the Keigher Irish Dancers and the Folk Group Rustic Detour for providing their talents on this wonderful day! On December 12th, Fr. Alejandro Daza and Fr. 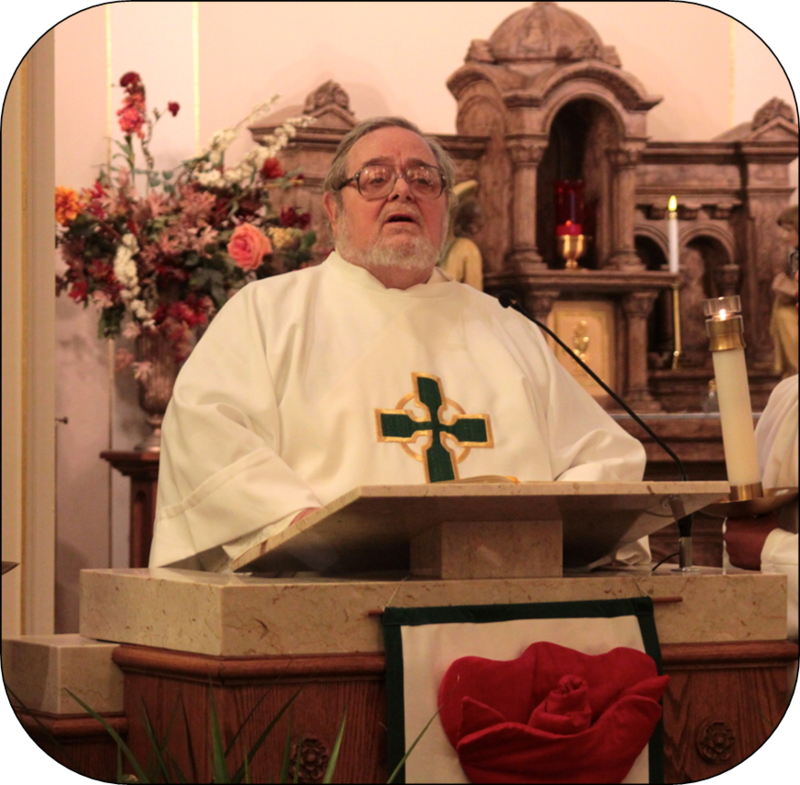 Pete Jankowski served the faithful of St. Patrick's with a Las Mananitas Celebration and Mass at 5:00 a.m., a Rosary at 12:00 noon and a 7:00 p.m. Mass and Fiesta. Fr. Pete also heard 24 hours of confessions from 8:00 a.m. on December 12th until 8:00 a.m. on December 13th. Take a look at the great faith shared by the St. Patrick's Community! On October 4th, the students from our Religious Education Program gathered in our Marian Garden to learn about the Rosary and to pray as a school community. Much thanks to Julie Dillenburg (our Director of Religious Education) and all of our teachers for their dedicated work on behalf of our kids! On September 26th, our parish community gathered to celebrate good food, music and dancing while helping raise the $16,000 necessary to repair our church roof. Much thanks to El Rio Grande Restaurant for all their help during this event! On July 11th, three hundred strong came to St. Patrick's Inaugural Summerfest Celebration, sponsored by Greg Bucciarelli and The Fender Benders. Much thanks to all our sponsors and those in attendance for your support of this event. On June 14th, Bishop Joseph Siegel came to St. Patrick's Church to celebrate our Annual Confirmation Liturgy. 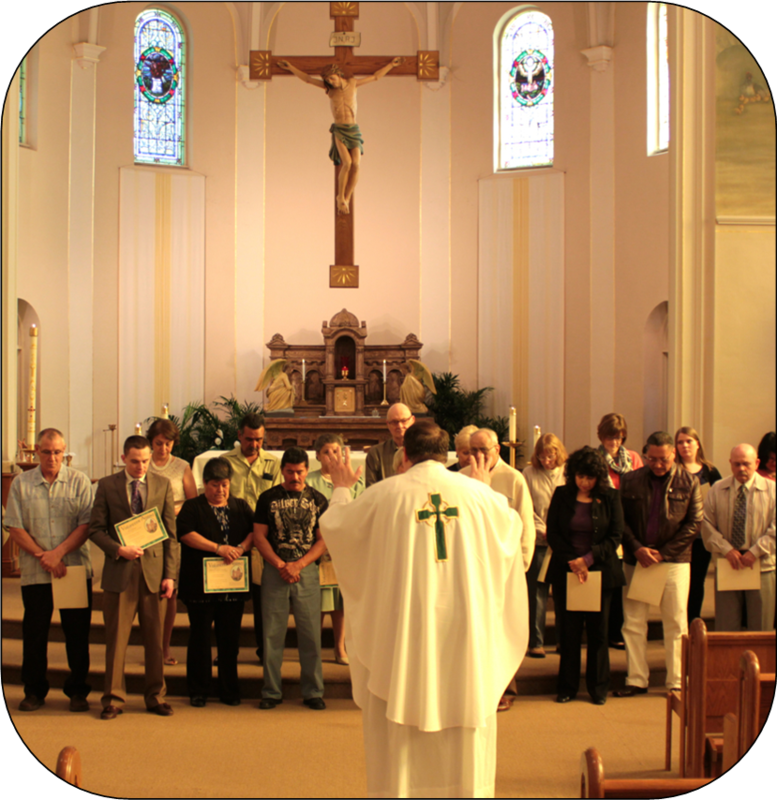 Sixty-Five Students from the parish received the sacrament, an amount which this parish has not experienced for a single class since the mid-1970s. 2015 Confirmation Liturgy with Bishop Siegel. On May 9th, Fr. Pete Jankowski offered the Holy Eucharist for the first time to some seventy children at St. Patrick's Church. Prior to our students' First Communion, the children share a prayer service with their parents which includes a light dinner, blessing of religious articles and Enrollment of the Scapular. This year's event took place on April 21, 2015. 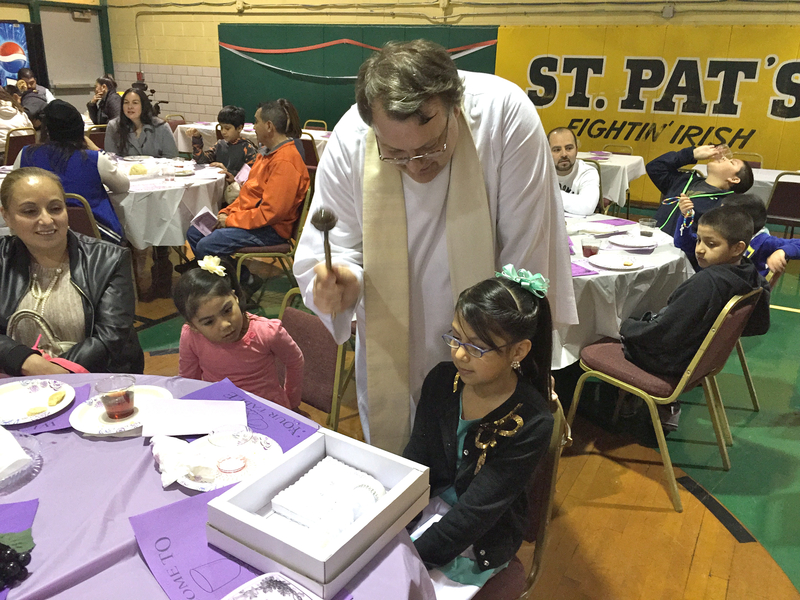 Also included are the pictures from the First Communion Retreat on April 11, 2015. 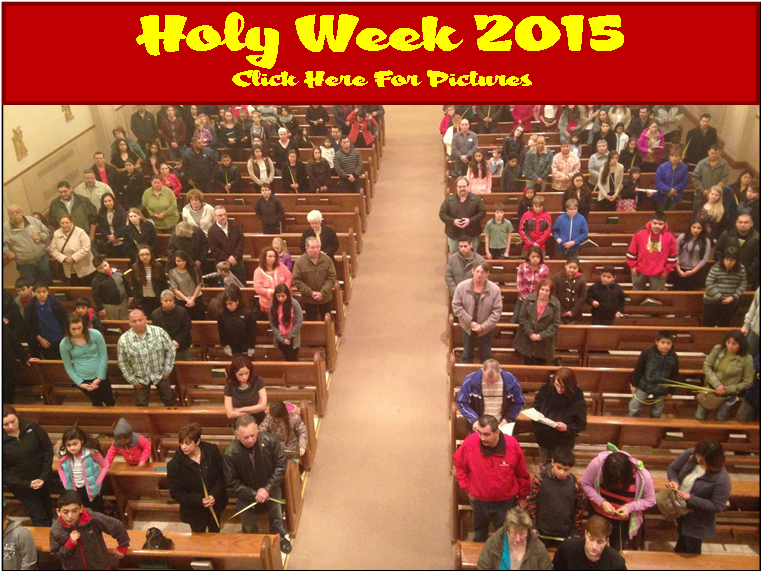 We are most grateful for the wonderful participation at our Holy Week services the week of March 29th. So many faithful souls were involved with making this week a great success! On September 27th, the faithful of St. Patrick's gathered for their monthly Mass & All-Night Adoration, with confessions being heard until midnight. 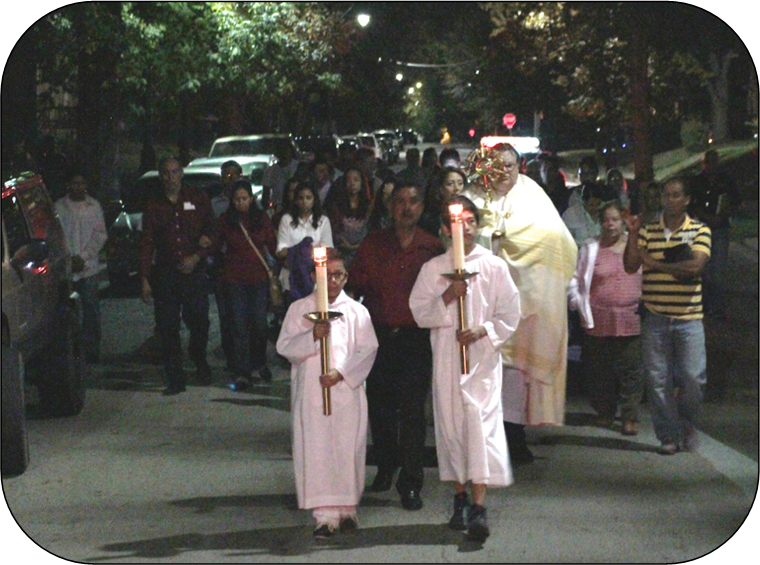 This month, we took to the streets with the Procession of the Blessed Sacrament. Our Parish's annual Polka Mass & Parish Picnic took place on September 20th under sunny skies and a seventy degree temperature. Thanks to the Polka Massters in the Church, our roving mariachis outside, our Aztec Dancers and Bill Strahanoski with his Polka Trio, a great time was had by all throughout the day and night. 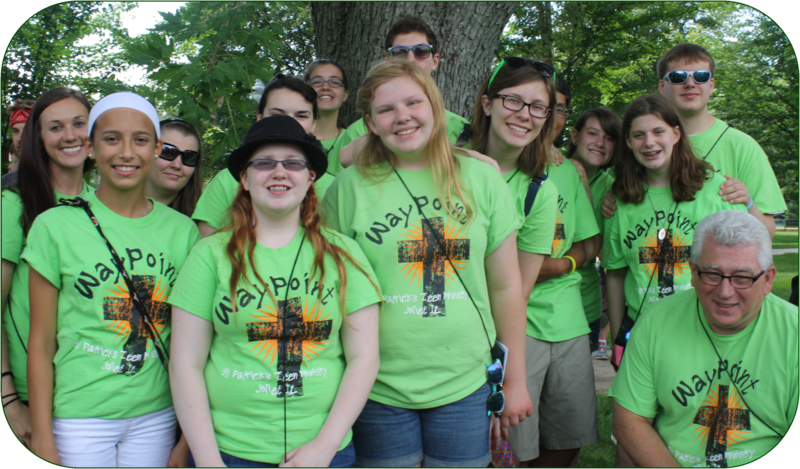 From June 27-29, the WayPoint Teen Youth Group from St. Patrick's Church attended the diocesan Youth Leadership Convention at Lewis University in Romeoville. Over 700 students from around the diocese attended the event. On May 17th, we culminated our 175th Anniversary Celebration with our annual Mass & Appreciation Dinner for our Volunteers. At the dinner, we honored those in our parish who have served us in any capacity this last year. We specifically honored one person from each ministry as a symbol of the larger number of volunteers who quietly go about God's work on a daily basis at the parish. Those honored at our Parish Appreciation Mass & Dinner gathered in the St. Brigid Chapel for a photo on May 17th. They are (First Row, Left to Right) Kathy Kelsey (Youth Group Representative), Mimi Hernandez (Finance), Kaitlyn McPartlan (Youth Group), Carolina Hernandez (Guadalupanas), Maria Jankowski (Pastor’s Pick), Joe & Joan Bannon (Pastor’s Pick) Margarita & Onésimo Chavez (Pastor’s Pick), (Second Row) Evangelina & Rafael Hernandez (Pastor’s Pick), Bob Ruettiger (Food Pantry), Kathy Wilhelmi (Homebound Ministry), Alicia Tocwish (CCW), Margo Gummess (Music), Silvia Sarver (Religious Ed), Nancy Bannon (Finance), Lety & Eduardo Dimas (Music), (Top Row) Jim Smith (Maintenance), Fr. Pete Jankowski, Sue & Don Cordano (Pastor’s Pick), Wally Martin (Pastor’s Pick), Julie Dillenburg (DRE), John Roach (Homebound), Mike Harvey (Parish Council) and Jim Dietz (Pastor’s Pick). On May 10th, Fr. Pete Jankowski offered the Holy Eucharist for the first time to some eighty children at St. Patrick's Church. This year marks the high point of our Religious Education Program, where three times as many students have attended our classes since 2006! On March 29th, Bishop Joseph Siegel came to St. Patrick's Church to celebrate our Annual Confirmation Liturgy. 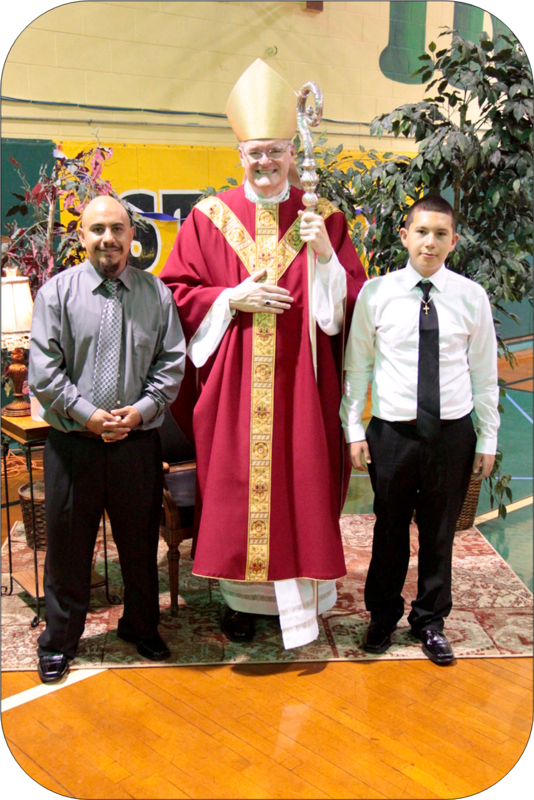 Forty Students from St. Patrick's Church in Joliet and St. Joseph's Church in Rockdale came to receive the sacrament. 2014 Confirmation Liturgy with Bishop Siegel. As St. Patrick’s Church celebrated Easter Sunday for the 175th time in our illustrious history, we remember those moments from this year's Holy Week Services that commemorate this most holy time in the Church's Liturgical Year. As we recall this weekend the wonderful moment of grace from the empty tomb of 2000 years ago, we also give thanks to those in today’s age who “enter the tomb” for the first time, our RCIA candidates and catechumens who are receiving the Easter sacraments as well. There is much for which to be grateful at St. Patrick’s and we are so blessed to serve those who make up our parish community. St. Pat's "Festival of Forgiveness"
As part of our Holy Father's request that each diocese offer twenty-four hours of straight confessions in one of their parishes, St. Patrick's took Pope Francis up on his offer. Fr. Pete Jankowski decided to hear confessions from 8:00 a.m. on April 5th until 8:00 a.m. on April 6th. Below you can read Fr. Pete's reflection on the event itself as well as an audio interview with Timothy Cardinal Dolan on his weekly New York radio program. 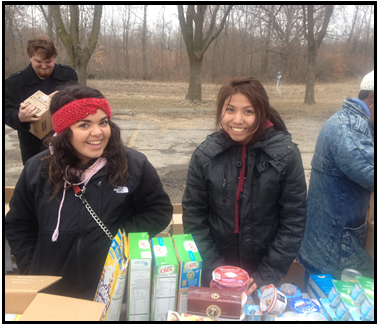 On March 29, about thirty of our Youth Ministry and Confirmation students journeyed to Hopkins Park, IL (one of the poorest cities in the state) to help work at their local Food Pantry. As the Pantry is held outdoors each week due to the lack of facilities, the students learned about the important lesson of poverty and our great need for service. We have included some pictures from the event for your perusal. On March 9th, we were blessed to welcome Fr. Ed Shea to the Parish. Fr. Ed led us in a wonderful Parish Mission, which was accompanied by our Annual Irish Mass & Dinner. Over 200 tickets were printed for the event - we ran out of tickets and had to recycle the old ones in the process. Here are the highlights. We are blessed to have thirty students as part of our Confirmation II Program, with another seventy students as part of Confirmation I. Much thanks to Rick Knoble, Andrew & Charlie Workman (our Confirmation II Catechists), Emily Limbach & Rosario Gurrola (our Confirmation I Catechists) and Julie Dillenburg (our Director for Religious Education). 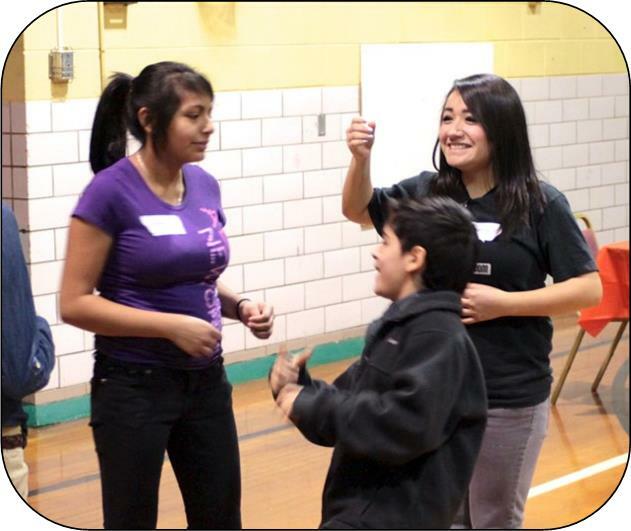 Here are pictures from this year's retreat for the Confirmation II students. This year, we are so grateful for the almost thirty faithful who helped us clean the church andx decorate it in preparation for our Christmas Celebrations. 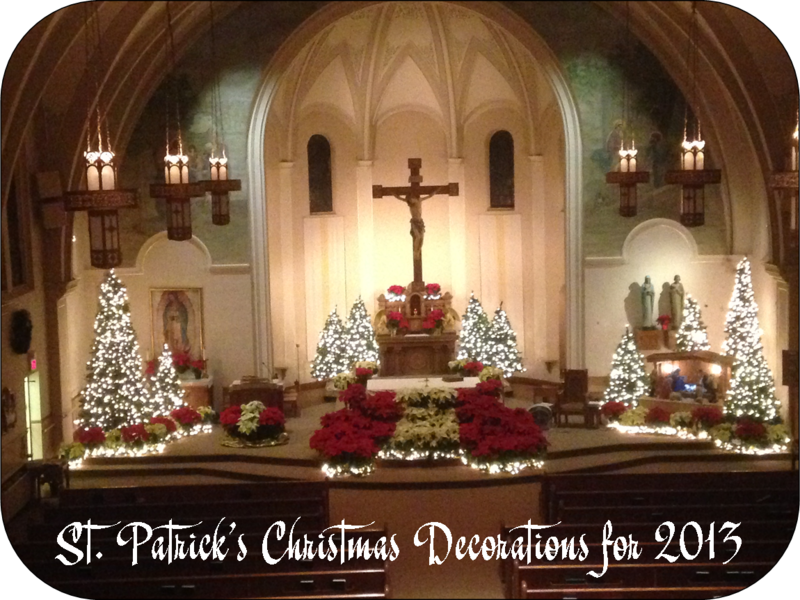 As always, the group did a spectacular job of preparing the Church for the Christmas Season! On December 12, 2013 in temperatures reaching six degrees below zero, St. Patrick's Church started its day at 4:00 a.m. with the annual Las Mananitas Celebration for Our Lady of Guadalupe, culminating with our 7:00 p.m. evening Mass and fiesta. So many of the parish were involved at the event and we are grateful for our Guadalupanas, our Hispanic Community and our Staff for their wonderful contributions for the event. 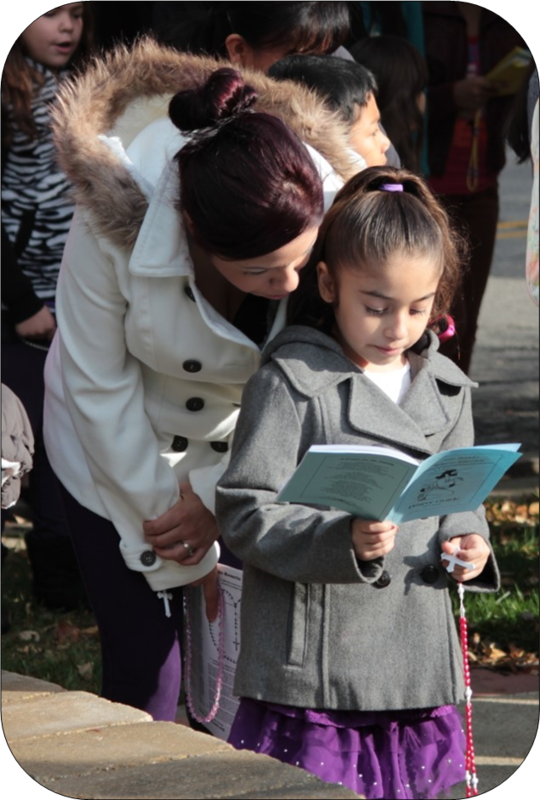 On October 20th of 2013, our 320 Religious Education students joined their parents for our annual Outdoor Living Rosary at St. Patrick's Church. Much thanks to Julie Dillenburg (our DRE) for her great work in planning the event! On Saturday - October 19, 2013, Spanish choirs from the diocese were led by Amilcar Rojas during their Fall Retreat at St. Patrick's Church. We were honored to welcome retired bishop Most Rev. Joseph Imesch to St. Patrick's to honor Deacon Chuck, who has served St. Patrick's Church as a deacon since 1988. 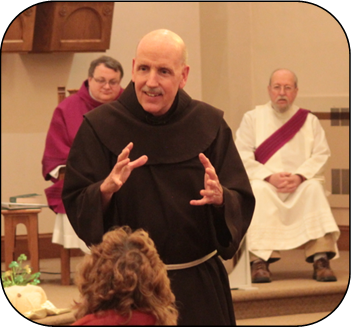 Currently, Deacon Chuck chairs our St. Vincent de Paul Society and is Head Chaplain at Stateville Correctional Center in Crest Hill. On October 5th, Fr. 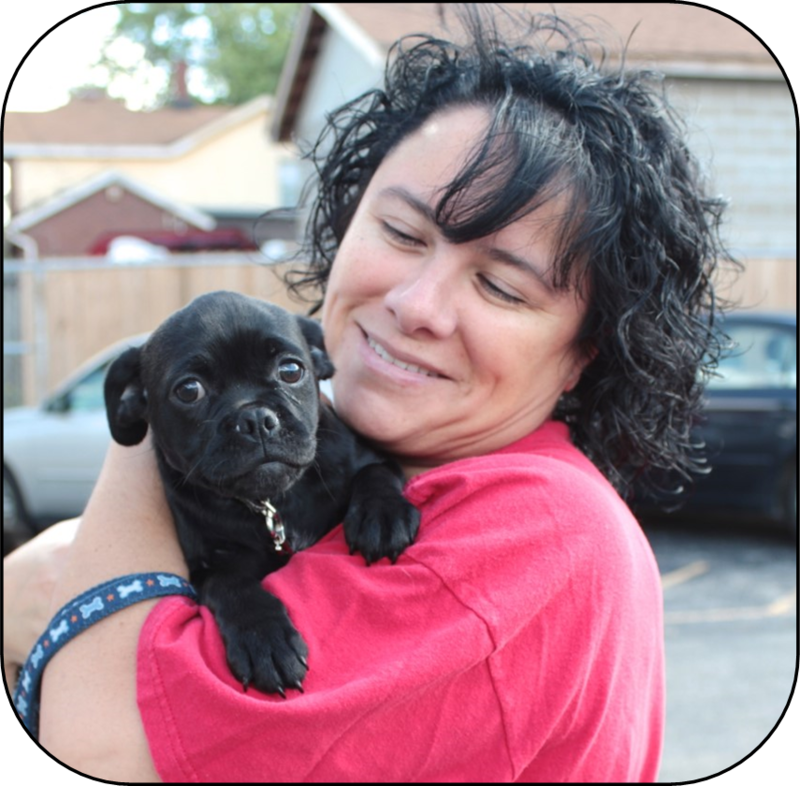 Pete Jankowski joined the University of St. Francis Alumni and the faithful of Joliet for the annual blessing of the pets at the Will County Animal Control. On October 6th, Deacon Darrell Kelsey blessed the pets on the grounds of St. Patrrick's Church. To a full house on September 7, 2013, Most Rev. R. Daniel Conlon celebrated our Parish's 175th Anniversary Mass. In attendance at this event were dignitaries from the city, state and national governments. Congressional declarations were read by State Sen. Pat McGuire and US Congressman Bill Foster. With a bagpipe procession and our combined choirs, St. Pat's offered a fitting liturgy that well-represented the history of our parish. 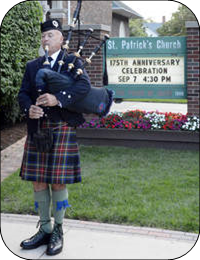 Established in 1838, St. Patrick's Church established Churches through the Joliet and Chicago area. 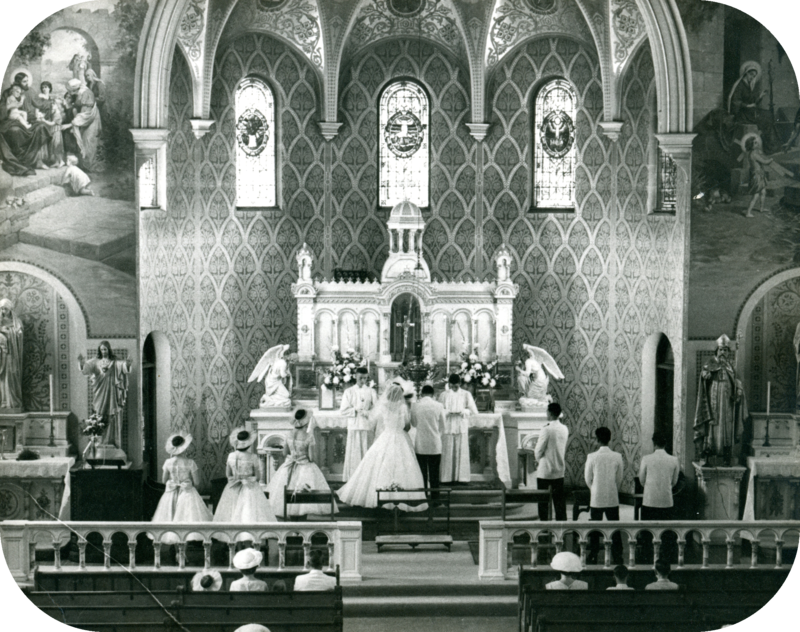 From St. Pat's stemmed for the parishs of St. Patrick's in Lemont, St. Joseph's in Lockport, St. Mary's in Minooka, St. Patrick's in St. Charles, St. John the Baptist in Joliet, St. Mary Carmelite in Joliet, St. Raymond's Cathedral in Joliet and much more! To view pictures from our history, feel free to view our cillection.